Each month the Disney Parks Blog highlights new and seasonal sweet treats that are being served in Walt Disney World and the Disneyland Resort. This month, Briar Rose Gold desserts are featured on both coasts! 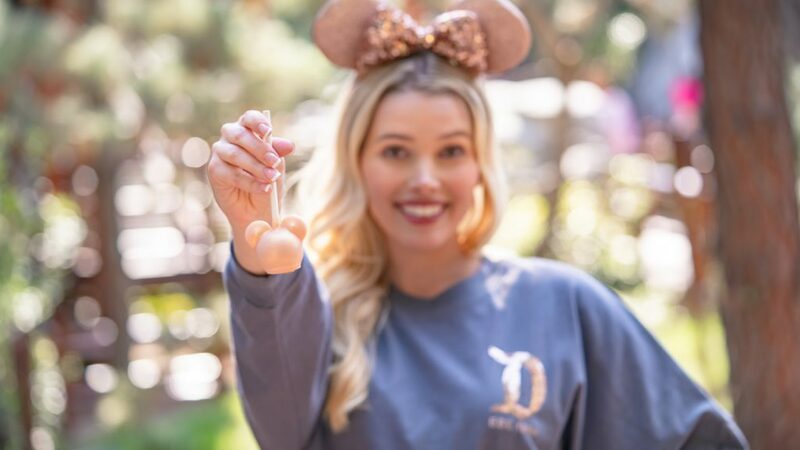 This new Rose Gold Cake Pop [above] can be found at the Candy Palace in Disneyland Park, Trolley Treats and Bing Bong’s Sweet stuff in Disney California Adventure, and Marceline’s Confectionery in Downtown Disney. Look for the Rose Gold Orange Cream Tart [above left] at the Marketplace at Ale & Compass and the Beach Club Marketplace. The tart features orange custard curd, plus vanilla bean mouse and white chocolate glacage. The Briar Rose Gold Scooter Pine [above right] is filled with marshmallow and raspberry white chocolate. The tasty treat is available at the Boardwalk Bakery. The Briar Rose Gold Raspberry Cake [above left] can be found at the Contempo Cafe at Disney’s Contemporary Resort. The elegant dessert is filled with vanilla custard. Several locations are serving the Briar Rose Gold Cupcake [above right] made with chocolate cake and strawberry filling, topped with buttercream, a mini waffle cone, and rose gold chocolate ears. 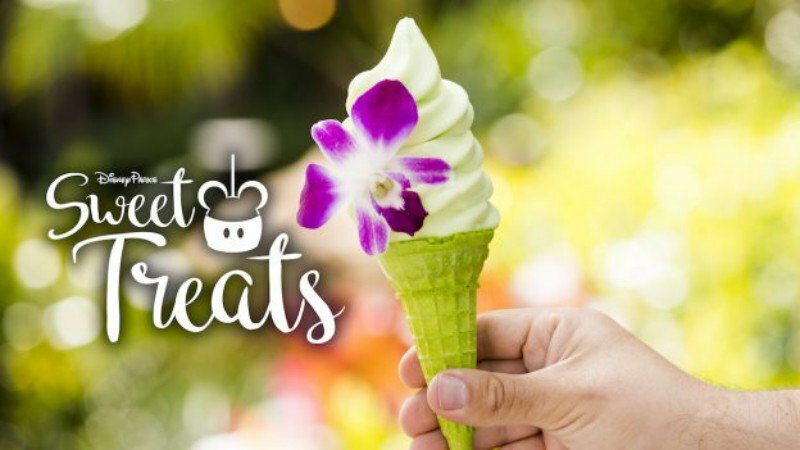 Look for this magical dessert at Disney’s All-Star Music, Disney’s All-Star Movies, Disney’s All-Star Sports, Disney’s Art of Animation Resort, Disney’s Pop Century Resort, Disney’s Port Orleans Resort, Disney’s Caribbean Beach Resort, and Disney’s Saratoga Springs. Capt. Cooks at Disney’s Polynesian Village Resort has their own Rose Gold Vanilla Cupcake [above left] filled with guava custard, then topped with rose gold buttercream and fondant. Wash it down with a Rose Gold Sunset Margarita [above right] from the Poly’s Oasis and Barefoot Pool Bars. The refreshing cocktail is made with tequila and orange liqueur, plus flavors of mango, guava, and ginger. Over at Disney’s Animal Kingdom, Creature Comforts is serving a Rose Gold Brownie [above left] topped with strawberry mousse and white chocolate ears. In addition to the Rose Gold madness, there are other treats to be found as well including this Most Beautiful Cake [above right] at Harambe Market. The coconut cake is filled with pineapple and topped with coconut mousse and served with coconut crisps. The Pineapple Lanai at the Poly is serving up the refreshing Te Fiti Cone [above left] filled with lime soft-serve, plus the Corazon Blanco Tequila Frozen Margarita [above right] made with Dole Whip lime! Finally, there’s the new Herbie the Love Bug Cupcake [above left] that’s available at All-Star Movies. The devil’s food cupcake is topped with chocolate mousse and white chocolate. Look for it now through May 31st. At All-Star Movies and All-Star Music, grab the Tinkerbell Cupcake [above right] now through the end of April. The chocolate cupcake has a key lime filling, and is topped with key lime buttercream and white chocolate wings, plus a bit of pixie dust.